Andre Aker and John Koekenbier from PerfoTec. Joshua Miers-Jones and Nick Hall promoting the BBC Technologies' blueberry sorting machines. The ladies from Unitec - Joanna Furmaniak and Federica Carminati. 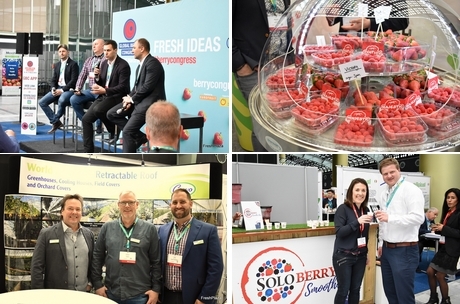 Aart Jan Bos from Beekenkamp and Marc van Gennip fromGenson Soft Fruit Plants, Aart had new tubs for growing blueberries, 35 and 45 litre with a special bottom for great stacking to cut logistical costs. Richard Salvage and Ronald Van Stein from Maxstim with a grow stimulator. Rihard spoke about his company's major preparations for Brexit. Cindy van Rijswijk from the Rabobank gave a talk on soft fruit production. Nabil Belmkaddem from best berries gave an overview on Moroccan softfruit production. Lovely strawberry varieties from Plant Science - Fragaria. Ruth Giraldo and Juul Franssen from Plant Science promoting strawberry and raspberry varieties. Infia were there with packing solutions: Joop de Vries and Alessandro Mariani. Perfect, almost too pretty to eat Sonsation strawberries from FlevoBerry who this year had their first year round production. Jan Robben and Steven Oosterloo enjoying a Sonsation strawberry. The trays from Obeikan can be printed with different designs, the company was among the first to think of reducing plastic packaging 11 years ago. Salvador Martinez from Obeikan with Nicole. Janko Jevtic and Marko Kokanovic at the KOKAN stand. The company has produced a berry harvester which harvests the fruit using air jets. Simon Munder from Deepfield Connect a start up which has developed a sensor for use in small tunnels to measure among other things, temperature and humidity. It is connected to an app so it can send a warning when limits are almost reached. Adam Sikorski and Witold Gaj from SoFruPak with a range of totally recyclable cardboard packing. Wout Roovers and Maria Jose Felipe Guevara from Special Fruit. Emma Gough, Promar International spoke about her experience in China. David Smith, Hortifrut Chile explained about the very fast moving Chinese retail trends. Online shopping and cashless payments. Steve McVickers from Giddings shared his experience of launching a brand in Asia. Koen Merkus from Fresh Forward had the Calinda strawberry which a great variety for growing in Spain, Morocco and Egypt. Luke Whittinton from Proseal explained the merits of the company's top sealer. Piotr Milewski from A&B Packaging promoting a blueberry packing machine. A group of visitors from Filber, Spain and Inka's Berries Peru. Dante Anton - Fruit World, Cesar Castrat - Special Fruit and Martijn de Graaf - Fruit World. Joao Rocha - Ace Growers and Fred Douven - abb Growers. Massimiliano Persico - Carton Pack with Nicola Borracci - Serroplast. Slobadan Obradovic - Drenovac, Vesselin Djodjevic - Blueberry Club, Milos Milovanovic, FAO Italy, Andrily Yarmak - FOA Italy spoke the Serbian soft fruit production and the need for investment to release the full potential there. Robert Bartha - Heritage Farms, Michael Aagard, Adrielle Dankier and Dirk Cederhout from Nature's Pride. Benjamin Martin, Robert Rouhof and Bede Millar from Cravo. SoloBerry were making smoothies at the smoothie bar! Rachel Montague-Ebbs and Robbert Leisink from SoloBerry. Gary Ward and Amnon Sandman at StePac. Francisco Vizquerra and Jose Alfredo Zambrando Govea from Giddings. Giddings Blueberries showing the new gold bee logo designed for the Asian market.